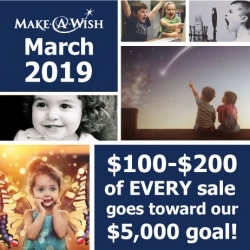 Pro Home Improvement is celebrating Make-A-Wish March 2019. $100-$200 from every project in March will go towards their $5,000 donation goal. Ferndale, MI, March 12, 2019 --(PR.com)-- Pro Home Improvement is a Michigan-based company with offices in Ferndale, MI. They are launching a charitable campaign called Make-A-Wish March. Many children in Michigan sadly experience life-threatening medical conditions. Make-A-Wish Michigan works to help those kids by enriching their lives. They do so with hope, strength, and joy. Pro wants to be a part of helping bring a smile to a sick child’s face and believes their customers do as well. That is why this time each year Pro Home Improvement comes together with Make-A-Wish Michigan to make one child's wish come true. How does the Make-A-Wish Month work? Pro Home Improvement will be donating $100-$200 from every roofing, siding, window, insulation, and gutter project they complete. The goal is to raise a $5,000 donation for Make-A-Wish Michigan. They are part of the wider Make-A-Wish Foundation. The Michigan chapter grants one wish a day for children with life-threatening conditions. They believe that giving kids a memorable experience can be a game-changer. Make-A-Wish Michigan feels that wishes aren't just "nice things" to give to sick children. They believe each experience gives hope to those kids and they feel they help to make the world a better place. One of Michigan's leading roofing, siding, insulation, window, and guttering companies. Pro Home Improvement has over 13 years of experience and has a team of skilled experts. They are a proud member of the Better Business Bureau and serve all of Southeastern Michigan.